What Evidence Do I Need To Prove My Claim For Past Care Fees Paid? Care to be Different > Articles > Care Fees > What Evidence Do I Need To Prove My Claim For Past Care Fees Paid? If you are pursuing a claim for past care fees that were incorrectly paid, for example if the individual in care was wrongly assessed for their eligibility for NHS Continuing Healthcare Funding (CHCF) or even not assessed at all, then you may be able to re-claim those fees paid. This could potentially amount to many thousands of pounds! – see How Do I Claim Back Care Fees That Have Been Paid? In order to maintain a retrospective claim, you can only go back to care fees paid after 31st March 2012, unless you have already lodged a claim with the CCG before that date. Note: In addition, you are entitled to claim interest on the fees that have been paid on the refunded sum. This can often be a very substantial sum, and in some cases can be equivalent to the amount of refund itself! The interest often gets so high because of the inherent and inordinate delays in the NHS processing these retrospective claims – largely due to the high volume and back-logs, compounded by a lack of resources to be able to in obtain and collate the care home and medical notes and records quickly, assess them and then process claims efficiently. We hear of cases where the NHS have put up hurdles and have been obstructive to try and defeat a case, rejecting it unfairly – causing families untold stress as they have to appeal – all adding to delays. Sometimes a Local Resolution Panel decision may go against the individual necessitating an appeal – which also takes time. In the meantime, if the claim is ultimately successful, interest has been accruing all the time at our, the tax-payer’s expense – whilst the NHS get their act together to review and process these claims through their pipeline. As retrospective claims are usually made by family members, long after the individual has passed away, far too frequently, we hear that family members have thrown away key evidence to prove their entitlement to claim. So for example, where a family get a positive decision and it is found that their relative was eligible for Continuing Healthcare Funding (CHCF) – that is not the end of the matter. You have to quantify your loss. What proof do I need to claim for past care fees? Usually statements of account from the nursing/care home is a good start to prove what you have paid during the win period of eligibility. If you haven’t already got them handy, you can always ask the home to provide a copy set for you – preferably on their letter-headed stationary. In addition keep all letters, correspondence and documents which might show changes in the annual fees to be charged. Invoices from the care home are essential, as proof of what has been charged as this should marry up with the statement of account provided by the care home. Quite often CCGs will also ask for bank statements as actual proof of what was paid to the care home in fees – to double check that what the care home has invoiced for was actually the same amount paid. If you haven’t got the bank statements for the win period, ask your bank to send you copies, but be aware that some banks like Barclays have a policy of only keeping bank records for 6 years. What if I don’t have proof or have thrown papers away? After the individual has passed away, it is not the family’s first thought to make a claim for a retrospective review. It is quite reasonable that without thinking, that critical documentation may be thrown out believing it not to be relevant in an effort to de-clutter the place. However, these key documents and papers are VITAL and will be needed as future evidence to prove the level of fees paid and to calculate loss to be claimed. The ‘defunct’ papers are thought to be useless now that the individual has passed on and therefore not worth keeping. However this is critical evidence and must be retained. In the event of a successful claim for retrospective care fees, the burden of proof is on the individual to prove their loss. Without the supporting documentation, such as statements from the care home, proof of any increased fees, invoices etc., the CCG will often reject the entitlement to be paid out on the grounds of insufficient proof. You will have a tough uphill battle to persuade them to pay without sufficient proof. Rest assured the CCG will not be rushing to help you in this quest, no matter how hard you plead or try and persuade them – as it is not in their best interests to do so. It is your claim – you have to prove it to their satisfaction. You have therefore possibly spent a good number of years in successfully arguing your case for a refund against the NHS only to find that it is a ‘Pyrrhic victory’ and you have wasted your time after all that trouble. How frustrating! No evidence means no payment – unless you come across a very sympathetic CCG who will do a deal. 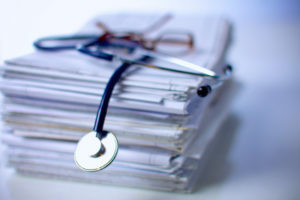 Circumstantial evidence is second best to having actual hard proof of care fees charged and paid – but it may be the best you can do to build your case. TIP: It is therefore vital to keep such documents, particularly statements of account, invoices and any bank statements. TIP: As soon as you have decided that you are going to make a retrospective claim – look for evidence to prove your claim and keep it safe. Tell someone else where you have put the documents as well in case you forget as it may be some months or years before your case is finalised. If moving house be sure to note where you store the records. What if the care home has closed? We have also heard from families where they have tried to approach the care home for information, but too late – as they have either now closed down or the home has been destroyed, staff have moved on and don’t know where the records are archived, the records have been destroyed, the financial records are in an administrative mess, computer systems have changed, manual records have been destroyed or lost, ownership has changed and the new owners are unco-operative to help track and trace any records etc. Therefore, we cannot stress enough that you must get and keep the evidence at the outset, as you never know if the care home will close and you simply can’t get the records.